High quality reusable grade crile forceps. 5.5" curved. 5.5" straight available as well. The difference between crile and kelly forceps is that while the serrations on the inside grips of the kelly forceps only go halfway down to the hinge, the serrations go all the way back on the crile. Please note the picture seen on the kelly page for comparative reference. 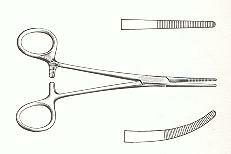 This page refers to the 5.5" Crile Curved Forceps. To get the 5.5" Crile Straight Forceps, click here. This product was added to our catalog on Friday 24 December, 2010.